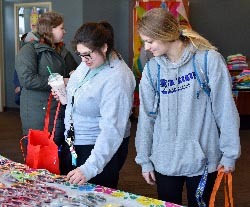 Over 140 students attending Wednesday’s event were able to create their own Spring Break survival pack that included items such as toiletry bags, sunglasses, travel tips, first aid kits and much more. Northeast students and faculty will be on spring break March 4-8. The kick-off was sponsored by Northeast Health and Wellness, Student Activities Council and the Alcohol and Other Drugs Task Force.